17" Front and 14" Rear big Tires are great for speed and traction making them a perfect tire to ride off road with. You can push the envelope of your 125cc Dirt Bikes with these. Manual Transmission: Take fully control of the dirt bike, Pro's Choice! Front and Rear Disc Brake Powerful and durable disc provides excellent braking at any speed; giving you the safety you need. High-Strength Steel Frame: much heavier than others, very strong and cannot be broken easily. DB-W008 is the best dirt bike you could get in the market for less than $1000. This bike was designed by experts and used by pros. 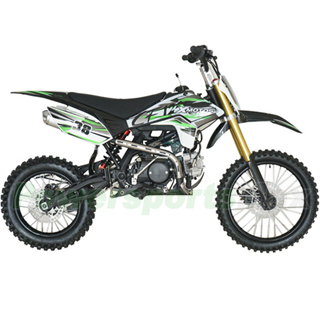 Our 125cc dirt bikes are the ultimate in competition racing bikes that have a high performance 125cc 4-stroke engine with Manual transmission and big 17"/14" Wheels. High-Tensile Steel Frame much heavier, stronger and cannot be broken easily. We paid great attention to the balance of our dirt bikes. Front fork, suspensions and tires are special designed and tested. You will have smooth and comfort ride experience with our balanced bikes! As any rider would tell you, power is nothing without good brakes. The DB-W008 again comes with class leading front and rear disc brake, Powerful and durable disc provides excellent braking at any speed; giving you the safety you need. There are other well-engineered touches through out the bike, oversized pegs, rubber handle grip, long comfort seat etc. We stock all parts for DB-W008 from manufacturer directly, any problem or any need, simply give us a call and we will service you promptly. Just enjoy and have fun, DB-W008 is the ultimate dirt bike in its class! Your Expert Choice! Shipping charge for one single unit of DB-W008 is $199.95(Please login to see real shipping charge for these states: Florida, New York, District of Columbia, Connecticut, Maine, Maryland, Massachusetts, Montana, New Hampshire, New Jersey, Pennsylvania, Rhode Island, Vermont, West Virginia, Delaware, etc.) , and you will get discounted shipping price if you order multiple item. This is my second RPS dirtbike. My first was a 150cc Viper which proved to be too heavy for a 70 year old man like me so I gave it to my grandkids . . . they love it! This second dirtbike is just what I needed for the rocky trails & huge boulders here in Northern Nevada. This 125cc dirtbike is about 3" shorter, has a higher ground clearance, the seat is higher off the ground, and it weighs 80 lbs. less than the Viper. The engine is actually rated at 12 hp which is the same as the Viper. It also like the rear shock absorber which I adjusted for my 180 lbs. so that there's very little sag. I also love the 4-gears which is totally adequate. I suspect it's really fast but I've never had it in 4th gear due to the trails I ride in. Yesterday, I took it to the boonies just to see how far I could get to the surrounding mountains before I had to turn back. I was able to ford two streams and some rather steep grades before I called it quits. Fuel consumption is also really great and the large-capacity tank will probably run 2 or 3 days without refueling. I LOVE IT!!! These bikes arrived on time and the seller was very helpfull and the bikes were easy to assemble, started on the first kick and have provided great fun fun for me and the boys. I would recomend the the bikes and the seller to anyone as exceptional. First of all liked the price, checked local places, to high retail, put it together and get it started. Seller was so helpful, got it going, that 13 year old grandson loves it! I bought this bike for my 13 year old son for Christmas. He hasn't got to ride it yet, but I put it together and tested it out myself. Shifts out great and will pull hills just fine. Starts on first kick. I've been riding my entire life and for the money I would recommend as a good little starter bike. This is my second RPS dirtbike. My first was a 150cc Viper which proved to be too heavy for a 70 year old man like me so I gave it to my grandkids . ..